On Wednesday evening Chantilly gave birth to 3 pups, 2 were stillborn and one is extremely tiny yet seemingly fighting fit. The whole event was quite traumatic and it was the least I could do to stay with her until she was settled again. Compared to other births this one was quite bloody and Chantilly was intent on cleaning herself up followed by 2 hours of non stop eating. As the Little One was still very wet and getting cold I dried him off with a towel and gave him some massages. He was unable to hold his little head up or even walk as a newborn guinea should be able to do. 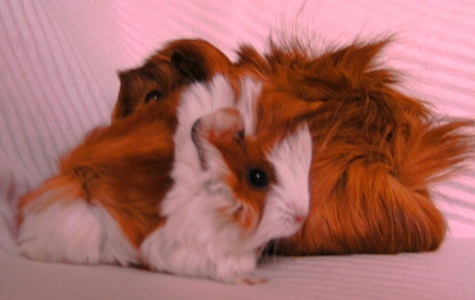 The majority of guinea pig births go well and no interference whatsoever is needed. Periodically he was put back in with Mum to check whether or not she was ready for him. Eventually she came over and lay by him and washed him thoroughly. No suckling seemed to happen that night- at least not while I was there but Chantilly was showing a maternal interest and it was the most that could be hoped for. The next morning I was prepared for the worst but was ‘greeted’ by a bouncing baby! The transformation was amazing 🙂 His head was now held high and he had sorted out how to co ordinate those large feet of his 🙂 Still no evidence of suckling from Mum but he tried his best to follow her around, despite getting tired out rather quickly. That evening he weighed in at 1.6oz/44g, I have been ‘brought up’ to belive that babies under 2oz do not stand a good chance of survival. For Chantilly’s sake I hope he makes it, she has been through so much- you really had to be there to know and feel the panic in her. She has settled into being a doting Mum but isn’t forgetting her own needs and is not backwards in coming forwards to ask for her food. This evening (Friday) Little One has been showing an interest in Timothy Hay and Spring Greens but can’t quite manage to eat them yet- unlike Bertha and Solo who were eating within hours of being born. At this moment I am hopeful for Little One, he’s showing every sign of being ‘OK’, who says size matters?! 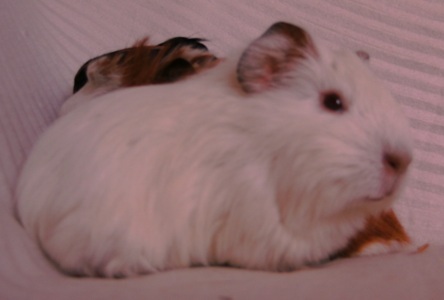 That was the pig that was called Butternut- or more affectionaly known as Sweet Butternut. 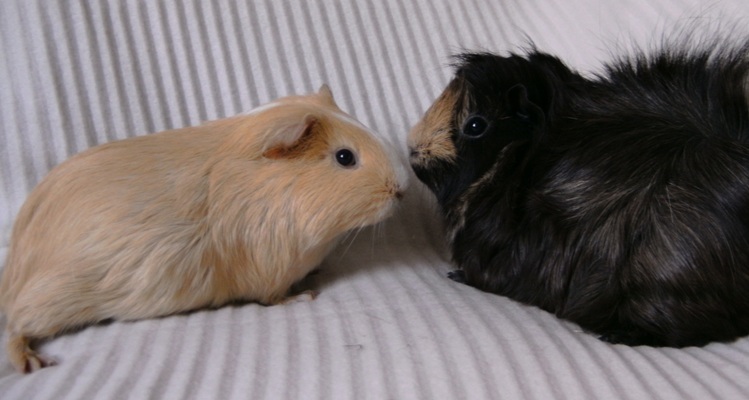 However the label”sweet” was to prove that however “sweet” a guinea pig is in either looks or nature, it is the combined characters of two guinea pigs that determine whether friendship will happen or not. When Butternut’s Boarfriend died in 2005 Chrissie contacted me about introducing her to another boar, Butternut was a passive sow and had been mild mannered in her last friendship, however, just to be certain of a well matched pair I asked Chrissie to bring her out so she could choose her own friend. 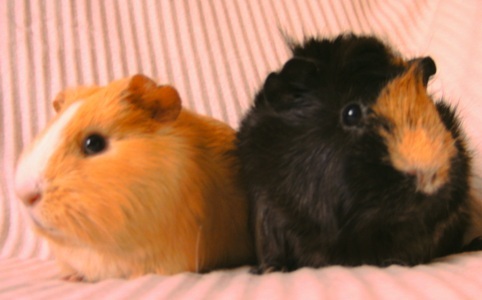 The only real suitor, given Chrissie’s preference for guineas over 2 years, was Sonar. We put them into a neutral run with no hidey holes and waited… Butternut, in no uncertain terms, made it clear that she did not like this arrangement and inbetween picking at pieces of grass she lunged at Sonar- who did nothing! A fiddlestix was added to the run but nothing changed, grass and hay was already available for distraction but what’s the point of waiting for them to finish eating and then attack each other- just prolonging the agony (a bit like bathing guineas when you introduce them). We (Chrissie and I) could see that this clearly wasn’t going to work out and Butternut went home alone, I certainly wasn’t preapred to let one of my boars go to a home where he wasn’t going to be accepted. Butternut did eventually choose Ice as her new friend from another rescue, although she refused to live with a sow that was living in a neighbouring Cavy Cage- with the divide up Ice was allowed to flirt with Maisie as much as he liked but if the three were put in together Butternut became anxious and protective of Ice. The two couples lived side by side. When she was just one year old Butternut showed symptoms of having a bladderstone, Chrissie rushed her to see James (vet) who confirmed that indeed it was a bladderstone. 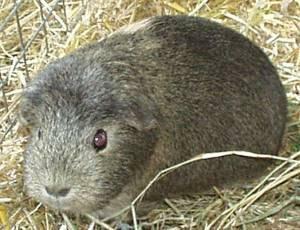 It is a common misconception that younger guinea pigs do not “get” bladderstones but plenty do, unfortunately this belief leads to trying other methods of relieving the issue but in the meantime the stone is getting worse and a bigger operation is needed. At 6 years old Butternut presented with another stone, she was “trying to pass” this one but it was just too large. Jenny made a small incision and removed tohe stone under a local anaesthetic, Butternut didn’t suffer at all from this- and no stitches needed! The other fallacy is that a “high Calcium diet” must not be fed in order to avoid bladder stones, unless foods are weighed it is impossible to tell if a diet is high in Calcium or not. The confusion is between feeding high in Calcium foodstuffs and a high Calcium diet- the two are completely different and a “high Calcium diet”is extremely unrealistic and difficult to achieve. 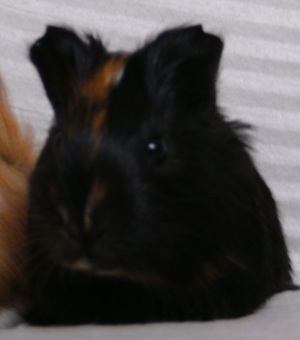 For further dietry information on feeding guinea pigs a blanced see www.planetguinea.info and Ratewatchers (data based on the USDA database). 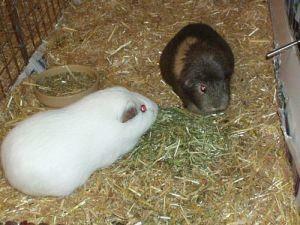 LWB is one of the car park pigs that arrived with the teenage mums. His back leg looked broken and he was not suckling from Mum. I think the enigma has been solved 🙂 Possibly, he was dropped, broke his leg, and broke his Incisors. Its quite likely that due to the sharpness of his broken teeth Mum was refusing to let him suckle. As baby bones heal relatively quickly he could have already had 2 wheeks worth of milk from Mum before she rejected him. In the wild this the length of time guinea pigs suckle for before Mum weans them. Today an xray confirmed that that the break is healing well and apart from having one short leg there shouldn’t be any complications at all, its being left to heal naturally and only Arnica is being used to help with the bruising. Interestingly enough LWB is the heaviest of the 3 babies. The other 2 were constantly suckling when they arrived and really not interested in hard food at all. When I gave them grass they would eat it but then it was straight back under Mum. Its been days now since they last suckled and I suspect they never will again. New Recruits and Teenage Mums, again. and her brothers, one of whom has a broken leg, though is managing with life as if nothing was amiss and is the most advanced of the 3, spending much of his time eating solid food while the others are suckling from mum.